By now, everyone is pretty familiar with the Peter Parker turned Spider-Man story line. Toby Maguire portrayed a great version of the geeky photographer Peter Parker in Spider-Man (2002), Andrew Garfield brings the cheeky badass we expect of Spider-Man to The Amazing Spider-Man (2012), and Tom Holland actually pulled off playing both personalities in Spider-Man Homecoming (2017). Whether you love them or hate them or think they’re just ‘meh’, it’s pretty safe to say that the Peter Parker story line has been done to death. But, if you’re anything like me, you’re just not ready to give up seeing Spidey on the big screen, no matter how bland its predecessors were. Spider-Man: Into the Spider-Verse (2018) is not only the superhero movie we wanted, but the superhero movie we needed. In fact, I’d go as far to say it’s so great that I’m ready to forgive Marvel for releasing Spider-Man 3 (2007) (I can say that, they made fun of it in this movie). Created by Phil Lord and Christopher Miller, Spider-Man: Into the Spider-Verse explores a universe beyond ‘just’ Peter Parker. 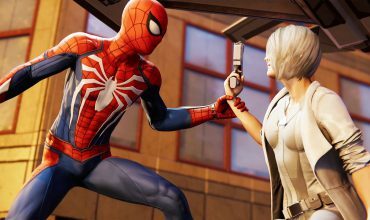 The story follows Miles Morales (voiced by Shameik Moore), a high school living in Brooklyn, New York, whose dealing with typical teenage things – oh, and the fact that he’s the new Spider-Man and just watched Peter Parker die in front of him. After a universal paradox of parallel dimensions opens up in the city, Miles must work with his team of Spider-People (and pig) to save the universe all while learning the ropes. Being the creative minds that brought us The Lego Movie (2014) and 21 Jump Street (2012), I expected an action comedy with tonnes of personality, and based on the trailer, a visually stunning and well-constructed animated universe. While my very high expectations were met, I still couldn’t have predicted how much I enjoyed this movie. Despite having several Spidey characters in the form of a group, the main focus is always on Miles. Peter Parker/Spider-Man (voiced by Chris Pine), Spider-Gwen (Hailee Steinfeld), Noir Spider-Man (Nicholas Cage), Spider-Ham (John Mulaney) and Peni-Parker (Kimiko Glenn), all fully realized, balance out each-other giving the audience the satisfaction of several movies in one without distraction or confusion. 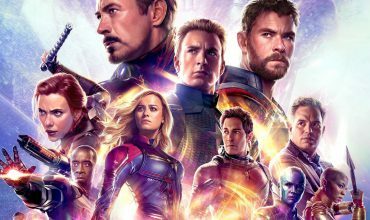 Overall, the story followed a typical superhero movie structure, but what was done better than any Marvel movie I’d seen recently was the balance of emotion throughout the film. There was never ‘humor’ to break the ice when things got ‘too serious’, but rather clear divides between serious scenes and humorous or action scenes. Too often at the end of an emotional scene, some lame joke is thrown in so the audience doesn’t get too sad for too long. Don’t get me wrong, this movie is hilarious – but there are also some moments where you really feel for the characters, and these are important in order to care about the outcome at the end of the film. 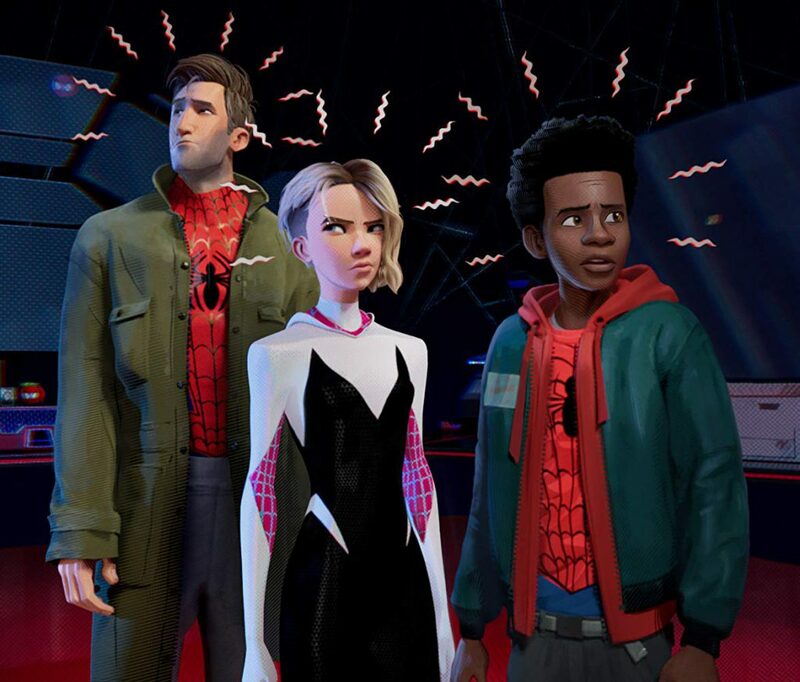 The modern music, in combination with the dramatic score, also adds to the idea that a film can be fun and serious, and while Marvel movies do take on this idea as well, Spider-Man: Into the Spider-Verse manages to find the perfect balance without it being obvious or predictable. While Spider-Man: Into the Spider-Verse was hilarious, had great characters, story line and music, what really strikes me about this film is the first-of-its-kind visual style. There are so many more opportunities for creativity with animation because there is no limit to what a character can do. Things like the iconic ‘Spider Sense’ and the Universe glitching effect look fantastic animated, it adds so much drama without running the risk of looking ‘fake’ or ageing. Angles impossible to capture with live action cameras and frame rate during action scenes are also used to full effect. The vivid colour and light to dark contrast is also something that Marvel tends to leave out in its recent movies. The animation and graphic design is straight out of a modern comic book; from the colour palette to the paneling and typography – this is something only an animated film can do this successfully (except for maybe Scott Pilgrim vs The World (2010), Edgar Wright can do no wrong). What I love about this movie is how much fun it is to watch. You can go in knowing nothing about Spider-Man and have it completely make sense. You can know nothing about comic books and appreciate the art design. You can hate superhero movies and LOVE this. Go see this unique and emotional roller coaster of a film. You won’t regret it. Check out Ashton’s thoughts on the film here!